St. Philip’s has been serving people in the greater New Hope area since 1921. Our church building was constructed circa 1810 as a one-room schoolhouse. It was known as “the Philips School” because the land had been donated by a local family of that name. Walking into the church building today is like stepping back in time: Many of the school’s original features have been retained, including the dais where the schoolmaster’s (or mistress’s) desk sat. The building was abandoned as a school in 1919 because of declining enrollment. In those days, Bucks County was the site of a number of “missions” of the Episcopal Diocese of Pennsylvania. Known as “center county missions,” they served the people of Langhorne, Feasterville, Southampton, Solebury, Buckingham and elsewhere. In 1921, the old Philips School was purchased by the Diocese and the mission in New Hope was established. 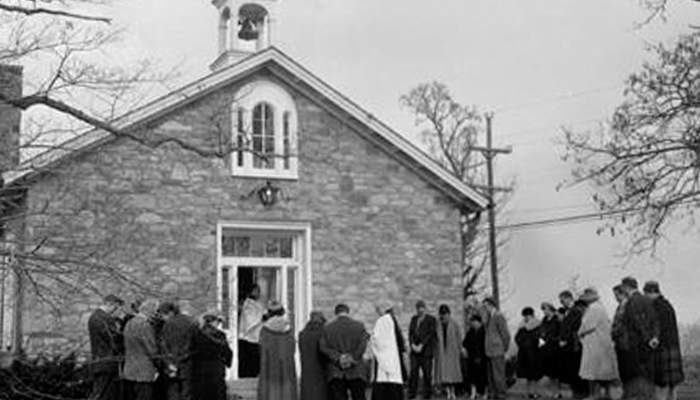 Between 1921 and 1943, the chapel served not only the local community but also the nearby Holmquist School for Girls. St. Philip’s shared clergy with Trinity Solebury until 1954, when it became a separate and self-supporting church under the canons of the Germantown Convocation. In 1958, the membership of St. Philip’s established “Friends of Saint Philip’s,” a nonprofit corporation, and purchased a small house nearby for use as a vicarage and meeting place. In 2012, the church opened a new parish house at 10 Chapel Road.